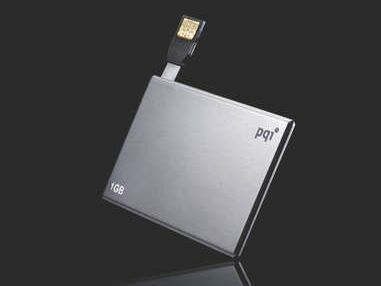 Look at the photo of the PQI U510 - doesn't it look appealing? You can't help but be drawn to a stylish- looking drive that's the size of a credit card, weighs only 23g and is available in sizes of 1GB (£27), 2GB (£46), 4GB (£84) and 8GB (£129). We've seen one or two companies try and make card drives over the years, but nothing with a capacity this large or this build quality. The U510's brushed metal finish looks tailor-made for a PowerBook or MacBook Pro, which is a good start. The drive case is the same shape and size as the average credit card, and if that wasn't thin enough, there's an even thinner USB dongle that tucks away into the drive, and then extends out on a wafer-thin cable strap to meet a computer port. It's a dongle without any of the plastic housing, just the naked coupling. When it's docked, a blue light then shines from the strap to indicate that you're connected. We transferred a bunch of 150MB files to and from the U510 drive with no problem at all. It's not the fastest drive we've seen, but it's certainly respectable. Speed isn't really an issue for this type of storage. If you were to line up 20 1GB drives at this price and time their transfer rates, you would be splitting hairs to find a winner. Because of its delicate dongle and thin, wispy strap, it feels a bit like you're treading on eggshells whenever you dock it. We worried about whether the strap was going to take the weight of the drive as it hangs from a port. This is particularly a concern on the vertical USB port of an iMac, but less so with the horizontal ports of a Mac laptop where the drive can rest its weight on the desk. Previous card drives we've seen tend to suffer from two key problems when it comes to build. Firstly, and more of an issue for guys than girls: if the casing isn't hard enough, the unit will buckle and bend in your wallet the first time you forget it's in there and sit on it. Secondly, the USB connectors can snap off. During two weeks of regular use we had no problems - helped by the fact that we didn't take it to the pub with us - but you can't chuck it about like a 1GB pen drive. The backup software that comes with the U510 isn't Mac- compatible, but insists on letting you know it's there each time you dock it. Just click 'Ignore' in the OS X pop-up warning panel, then you can read and write to it with ease.